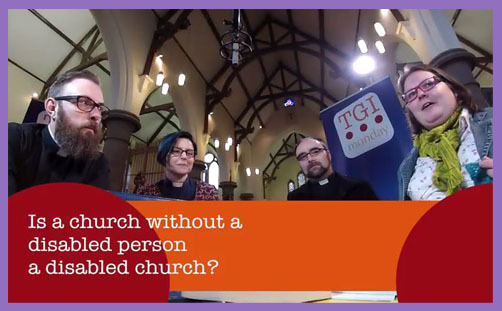 TGI Monday: Is a church without a disabled person a disabled church? What is disability? Is there such a thing as a disabled church? What are invisible disabilities? What is inclusion? What is access? How complete are the able-bodied? Many disabled people don’t come to church because they take one look at the stone steps and think they physically couldn’t get in, and those who could get in with a ramp don’t turn up for fear of troubling someone to get the ramp out. How can we solve the emotional or psychological barriers to participation in church life if there is no presence? Jesus healed lepers: we prefer to isolate the infected for fear of transmitting deformity. Are not the neediest people in society the weakest? Are they the most important in church? The pervasive view is that the weak and disabled are there to minister to (often with prayer for healing). Do they not also minister? What if they seek no healing? Surely every member of the body contributes something vital: the head may not say to the little toe, “I have no need of you.” Funny, isn’t it, how we view the disabled as a little toe or an appendix. Where is the Church’s Stephen Hawking? Perhaps (s)he couldn’t be bothered to trouble you to get the ramp out. We worship with our bodies: our bodies affect our faith. What if we can’t physically kneel? What if we can’t sing? What if we have no arms or hands to receive the Host? How do the deaf hear the Word? For future episodes, please feel free to send your questions directly to the TGI Monday team.